Dive on in for Part 2 of our detailed walk-through of the Zoom KD III, with insights and info straight from Leo Chang and the Nike Basketball team. You learned all about the design details and performance insights that went into building the Nike Zoom KD III in Part 1 of our interview with Leo Chang and the Nike Basketball team that works on Kevin Durant's signature product, but what about KD's personal input right after a full-on workout? Or the colorways he most wanted to see this time around on his third namesake model? Check out Part 2 of our Zoom KD III feature below, as Nike Basketball Design Director Leo Chang, Footwear Developer Dolores Thompson and Pro Sports Marketing Field Representative Charles Terrell help to walk us through both the shoe and what it's like to work with KD. Nike Basketball Product Line Manager Will Eberhart was also kind enough to join in on the second half of our roundtable discussion. Nick DePaula: The price point of KD's shoes is something that always sets him apart from other signature athletes. Is he contractually locked into that $88 zone and staying below $90 for the foreseeable future? Charles Terrell: There’s nothing on paper, but that was something that we’ve always been eye to eye on that’s important to him and that we said we were going to do. As he elevates, it’s going to be harder to do, and I think that’s the challenge. But that’s a welcome challenge, and I don’t think it’ll be something we shy away from. We’ll have conversations with him too, when we think the time is right to re-assess the business. NDP: In three to five years, Kobe will be older and LeBron will be onto his 13th shoe…. Will Eberhart: I think even more importantly for him, is his personal connection with the kids that are buying his shoes and how that relates to how he grew up. It’s more important to him to have a kid that can afford his shoes and have a kid that grew up like him be able to afford his shoes. We’ve seen it in the past, with a number of athletes who had very pricey shoes for their time period, who ended up going to funny companies. NDP: Don’t hate on my man CWebb! Eberhart: I’m just saying!! The reason was, guys who grew up like him couldn’t afford his shoes. It’s a personal thing for him to have his shoe be more affordable. NDP: Is part of the long-term plan in keeping his price-points low also just sharing the tooling? 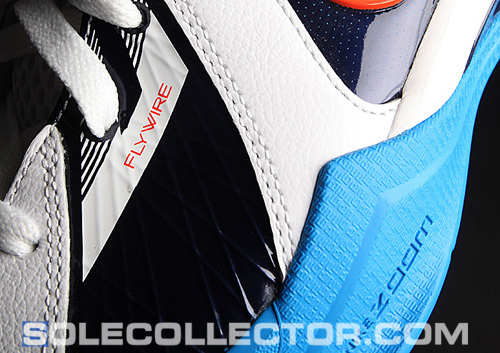 We saw the 1 and 2 carry over the same outsole. Dolores Thompson: Not necessarily. There might be certain upper molds like a KD logo or certain things that we might be able to share, but as far as the bottom tooling, no. NDP: So the IV won’t be on the same? Eberhart: As signature styles grow and evolve, you want more signature details in the shoe, and you won’t necessarily just share tooling. The goal is to keep him at a premium level as much as possible. Leo Chang: On that note, this is the first time in a long time that we’ve done as robust and as nice of a shank on an $88 shoe. That’s something we do on a $100-$125 shoe level or more. 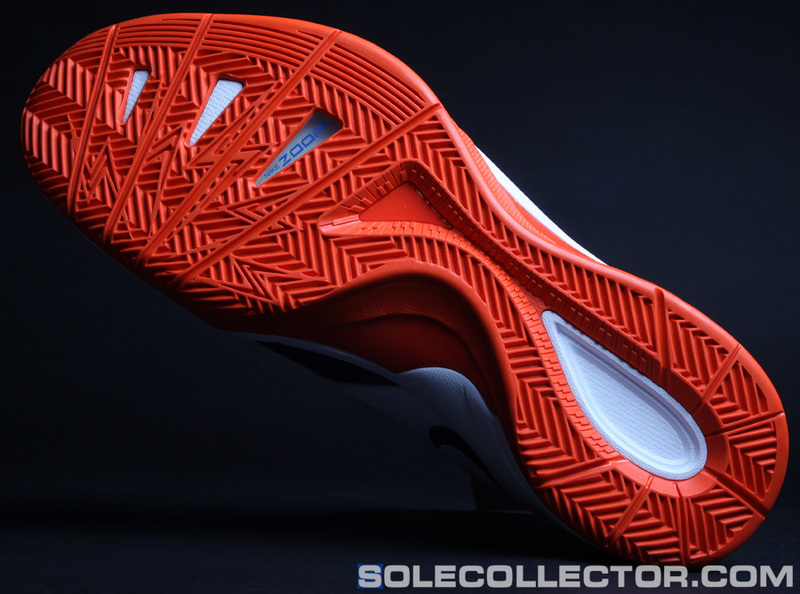 We have this nice 3D shape that really prevents the midfoot area from bending in weird ways. That’s something that working with the Thunder Director of Sports Medicine Donnie Strack, we were we able to learn more about just the biomechanics of KD’s foot. Some of the guys were wearing the Hyperize at the time that we started these, and they felt like it was bending in weird spots, and Donnie was pointing that out to us and why those players didn’t like it. 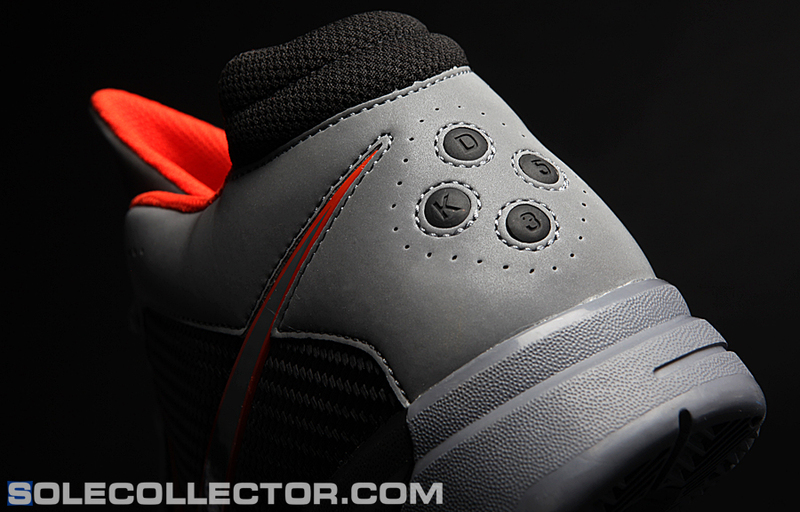 For us, it was all knowledge to incorporate into this shoe for him and his teammates, to make sure it doesn’t do that. Even after that meeting, we kept in touch and would always meet with Donnie when the Thunder came to town. Last time, he brought us actual X-Rays and MRI slides of KD’s foot, just to explain even further what was going on. Eberhart: Now Leo is being really modest, because the other side of that is Leo taking all of that information and incorporating it into the right places and still keeping the shoe key to the athlete and making it commercially viable for the rest of the greater population. 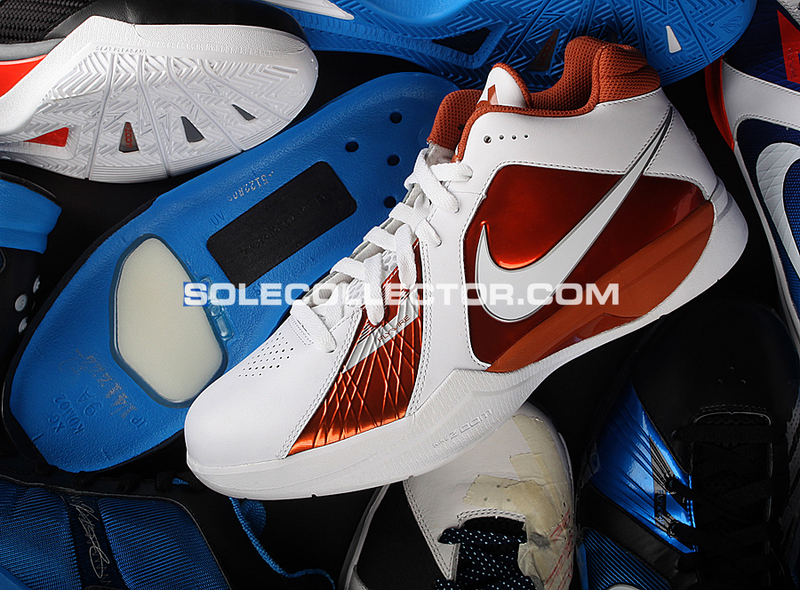 Above: A look at a Z-Corp 3D sample of the KD III's tooling. NDP: Can you guys talk about some of the colorways that we’ll be seeing? Chang: Obviously, he’ll be wearing his Thunder colors for home and away, and then we also are dong team colors for the first time. Eberhart: There’s four team versions, a White/ Varsity Red, White/ Varsity Royal, White/ Gorge Green and White/ Black/ Metallic Silver. It was kind of a play to just stretch out his color opportunities by virtue of him getting more worldwide. It was an opportunity to say, “How can we get this into a more broader range and into team basketball?” It’s not your traditional team bank plan that’s blown out in ten colors, but it is a team-based look for those four colors. Three of which are probably your most widespread team colors, and then the Gorge Green being a nod to Montrose Christian, his high school. Chang: The Black/ Photo Blue will be his away colorway, and then the white based with black, orange and yellow hits will be his home. Then, there’s also a White, Photo and Navy colorway for him to wear at home in the spring. We launched on Christmas Day in the yellow version of the KD3 that is basically this year’s Creamsicle. We let him decide what that’s called, like he did with the Creamsicle. He just made that up on the spot. He always loves bright, super bold colors on the shoes, and we wanted to play off of the yellow in their uniforms, and still have the team orange and photo blue in there to hook up as well. Using the fourth color in their palate was the goal, and we haven’t really used that color too much so far. We wanted to really blow that out, and we also used all reflective yellow 3M through the whole upper, and he loves that. Then, an icy yellow outsole to round it out. Terrell: The thing I like about this [Christmas] shoe is that, externally, I think it shows that he’s arrived, because our other two guys were wearing their special shoes on that day as well, in Kobe and LeBron. He was showcased, and it’s kind of his coming out party. It’s also us launching him internally, and saying, “Hey, he’s our guy and he’s prominent on holidays too.” He was excited about that too. NDP: How do you guys decide who on his team wears his shoe? Is it just offered to everyone? Terrell: Yeah, the whole team is offered to wear it. Some guys will wear it and some guys won’t, but the majority of them will wear the shoe because they like to support him. Other than it being him, it’s good product, and guys are really starting to take to wearing his shoe. Eberhart: We’ve seen it a few times with LeBron and the Soldier series, and we’ve seen it often with Kobe, where even a guy like Derek Fisher, when he was still with the goodfellas, before he crossed over to the dark side. [laughs] He was a guy who was notoriously in a Max shoe, and now he was wearing a Kobe signature shoe to show support. It’s one of the things that Leo has really taken and injected into the shoe, that entire team dynamic. He’s making sure that those guys are able to support him by virtue of wearing KD’s shoe, which we saw on November 19th versus Boston. Kevin was hurt, but guys still wore his shoe in support of their guy. It’s very rare that you find guys that aren’t jealous of one another and are actually supporting the guy that is getting the majority of the accolades and a lot of the attention. What’s also a funny story, or at least I think it’s funny, is that with the Black/ Photo Blue colorway, everyone constantly talked about a Black/ Red/ White being the “lucrative” or the most dominant colorway that you have to do at retail. It doesn’t make sense for a guy that plays in Oklahoma City! Our version of the Black/ Red/ White is the Black/ Photo Blue, and you’ll see that consistently. You saw it in the 2, it was the lead color for the 3, and you’ll see it in the 4 and so on. It’s Kevin Durant’s version of Black/ Red/ White. That was Michael Jordan’s colorway and what broke the mold. 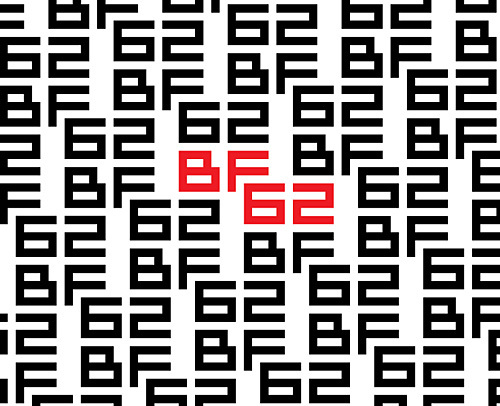 Naturally, if for the past twenty-five years you have the most dominant colorway at retail being led by the guy who pretty much changed the game, then Black/ Red/ White works for him. But does it make sense to do that for Kevin Durant, who’s colors are not tied to that and who has no connection to it? I don’t think so, so Black/ Photo Blue will be his lead colors and will continue to be. Chang: His colors aren’t White/ Black/ Red, but it was a new opportunity to do something different and start a new legacy of colors and do something that we could make a mark with. NDP: What about the Redskins burgundy and yellow colorway? Chang: That actually came from our trip to China with him, and we were asking him what other colors he wanted. Right away, he said, “I want a Redskins based colorway.” So we ran that version and it has a gumsole. Eberhart: That was just insight from the athlete. And, not what’s your favorite team, but what’s your heritage? Where are you from? The kid represents DC all day, and what’s most notable about DC? Redskins. So we ran with the Redskins, and it was a fight, but it’s been well received. 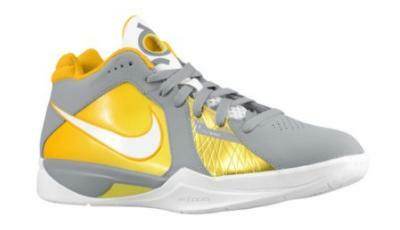 NDP: And this grey and yellow version? Eberhart: It’s also just in time for Easter, and Oklahoma City only has two uniforms, but we were just thinking aloud, “What if they get a third alternate uniform and what would that look like?” This is our take on what that might look like. Terrell: Did you tell the team what we’d like their alternate to look like? Eberhart: Oh yeah. I sent them an email. Chang: Lastly, we’ll do a Black and white version with a cool iridescent Flywire piece for the playoffs. One of the final details that I want to point out is just the tongue pull. It’s just one of those details that when you think about signature shoes, you want to have those iconic details that people remember. Every Jordan always had something that became iconic. That’s why they end up doing those hybrids where they throw all of those iconic details onto one shoe. [laughs] But we won’t be doing that. 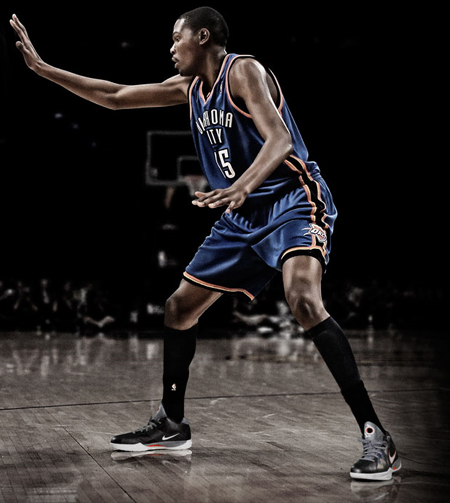 NDP: Man, don’t do a Fusion KD please. Eberhart: On a Free bottom! Chang: But that tongue is just one of those fun, youthful details there. He’s still young, and we want to have fun with his stuff. NDP: Obviously LeBron has a huge advertising budget and had his whole start of season campaign, but KD seems to be going the more viral route. Terrell: We’re the grassroots guys here. The thing about KD is it’s been a slow-burn type of mentality with him. Obviously, he was a phenom coming out, but we still didn’t throw him out there with a bunch of pairs of shoes in the marketplace and all of these crazy colorways. We started him off small, and second was bigger, the third will be bigger, and the fourth will be even bigger. We got a pretty good cadence now, and hopefully his marketing will pick up a bit next year. We’re happy with what we have this year, and we’re not satisfied yet, but we do see growth and that’s what you want. Everyone has been working hard on his product, being pro-active about things, and that’s the way that he is. He’s in the gym all of the time, and he’s always trying to get better and watch film, and it’s a dual action from both sides and you get great product out of that. Where we’re at now, he’s growing, and we’ve got a long way to go. We’ve got a phenom here, and we’ve got to push it. NDP: What inspired the “KD’s Neighbor” campaign, and was that something you guys created or was that a Wieden thing? Terrell: Wieden came up with it, and they were just feeding off of him and how he is. There was an actual neighbor in Seattle that was like that. He had a situation like that. The kid came by to drop some cookies off, and he had an interaction like that, and Wieden heard that in a meeting and they bit on that. Chang: A lot of the scenarios that are shown online, you guys just made them up on the spot. Terrell: Wieden had a list of stuff, and then they ended up just adding more to it. There was one time where we were just in the weight room, and he thought it’d be funny if he was showing Mathias how to lift weights. Then it ended up being something funny where we wanted to make a joke about KD not being able to do 185. Then, they showed him benching three plates or something crazy. NDP: Without showing the side of the bar of course. Terrell: I don’t know what you’re talking about! That’s the kind of guy he is though, and you can make light of some things with him. A lot of the videos that we did with him, we didn’t script any of it. Chang: Even the one where he’s in his scuba gear, that came from his Facebook picture of him wearing a wetsuit and scuba diving in the Bahamas. Terrell: For him to actually want to do that and be comfortable, that just shows his growth. It’s all been gradual. NDP: What kind of feedback on the KD III were you able to get just from meeting up with him? Terrell: They were going to show him the shoe in his size for the first time, and he’s waiting there wanting to try them on. Chang: We’re scrambling out of the hotel, throwing stuff in the bag and driving over to the gym, and that’s not normal for an athlete. He’s waiting for us to get there, and we weren’t even late. We were early. He’s there with his shoes off already all ready to go. Eberhart: What these guys aren’t telling you, is that he just got off of a plane too. It must’ve been about 6:30 pm. We were supposed to meet at 8, and his flight was supposed to get in at 6, so we figured he’d get in, put his stuff down and take some time to relax and then go to the gym. He went straight to the gym. No food. Guys that are with him are hungry and starving. [laughs] He didn’t just shoot around either. No, he went through a full workout. He did a two-hour workout with [Tim] Grover and is working on moves to get better for next season. That was the whole weekend. He gets up at 7 in the morning, hits the weights and goes to the gym. At his Skills Camp, he’d go through the drills full speed with the High School kids in the morning, take some shots in between, and then do all of the drills again when the college kids came. He’d grab lunch, get up a couple hundred shots, and then do the High School second session, and then do the College second session of the day. He’d go through at least three sessions a day! Chang: Right around dinner time, he went and did a community service thing at a bowling alley, and then went back to the gym at night. From 8 til 10 at night, he was just working out. Chang: It was instant. Just seeing him run around out there full speed, doing cuts, doing drills and doing whatever. Right afterwards, when he was taking a break, we’re asking him how they felt. Terrell: The thing with KD, is we’ve built that rapport, so he’ll allow us to get into his realm. Most guys want to just drink Gatorade and chill during a break like that, but he’s open to us. NDP: When you guys were talking with him in settings like that, what were some things that he knew he liked right away, and some things he wanted to see changed or improved? Chang: He just said it was a comfortable shoe, and he has a really narrow foot, so he just wanted the forefoot area to be tightened up just a little bit more. Overall, he was really happy with it. He thought it felt lighter. Terrell: I always talk about this new athlete that we have, and he’s different. We know that. Working with him, you can really see it. The public might not know that, but it’s our job to promote that in his shoe and in his product and whatever we do. It ignites us to make sure that we’re on top of what we’re doing, and are complete and detailed.